Trebles all ‘round at CBC-TV, where the Steve Ladurantaye Social Rehabilitation Program proceeds apace! Steve, readers will recall, was the CBC wunderkind in charge of reinventing The National in the post-Peter Mansbingo era. But then along came Ken Whyte’s cultural appropriation prize campaign and Ladurantaye, eager to be one of the kool kids in Kanadian media, fired off a tweet in support of Whyte’s ill-considered crowd funder. Cue the shitstorm. The healing has truly begun. Steve would get a better idea of what’s up with the Abo’s if he did his stake out at the North-west corner of Bathurst & Queen. Do they all wear pointy Whyte hats? Are Koyne and Kristy the Grand Imperial Wizards? Is Injun JoBo their mascot? 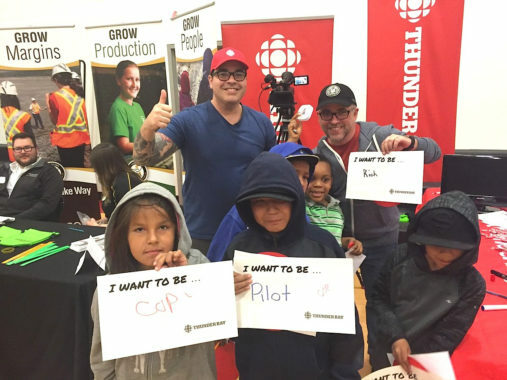 And does the CBC get to Sioux Lookout, Ont.? Pikangikum First Nation is located on Pikangikum Lake, approximately 100 km northwest of Red Lake, Ontario. Neil Macdonald (also of CBC, and recipient of more than 2000 comments for each of his columns before they cut comments off within the same day), revealed this week that Sue Montgomery, ex-Montreal Gazoo, is resigning from the MMIWaG commission media liaison next week. A place for Steve to receive his “woke” awakening for the summer? After all the “New” [unpolished and verdigris-ridden] National News is not starting until October–plenty of time to be a ‘better man’. “Evolve our storytelling strategies…” And what executive “retreat” produced that little gem? Next up…Steve learns the Innu have thirty-seven different words for “career-limiting move”.